Murir Moa or Puffed Rice Laddu is a traditional Bengali Sweet which serves during Pujas like "Kojagori Lakshmi Puja". This Moa is a giant size Laddu made with Puffed rice and jaggery. This is not very easy to make. Usually people nowadays bought this Moa from the market. But in USA it is difficult to find this item in stores. So here I tried to make this and share the recipe with you. 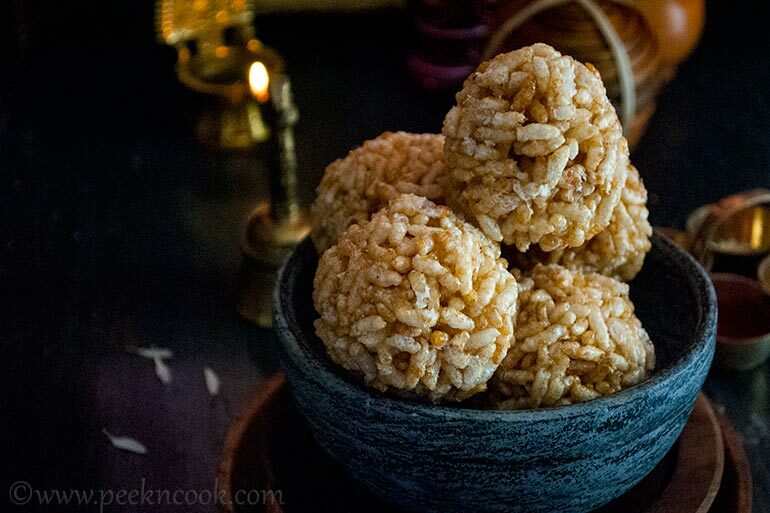 Murir Moa or Puffed Rice Laddu is a traditional Bengali Sweet which serves during Pujas like "Kojagori Lakshmi Puja". This Moa is a giant size Laddu made with Puffed rice and jaggery. Dry roast the Puffed Rice or Muri in a cast iron skillet for about a minute till they are crisp. Take them out from the skillet and keep aside. Take a heavy bottomed pan and add the jaggery, water & crushed green cardamom seeds & bring it to boil on medium low heat and cook stirring frequently. The syrup starts becoming frothy. Cook for about 15-20 minutes till the jaggery syrup becomes in sticky consistency. To check, pour a drop of syrup in a bowl of water. If the drop can be rolled into a small ball which doesn't loose shape in the water, the syrup is ready. Turn off the heat and add the puffed rice. Mix well with the syrup. Do not let it cool down, immediately apply a little ghee to your palms. Take around a palm full of the mixture in your palm, press gently and shape into a ball. Do the same with the remaining mixture before it cools down completely. Makes around 12 moas.